Lucas Rocha didn't know he'd be a reluctant hero. Lucas Rocha never meant to become a drug dealer. But when he picks the wallet of vacationing DEA Agent Daniel Burke, Lucas becomes a pawn in the battle between Rio's drug cartel and lawmakers' attempts to bring them to justice. The lives of these two strangers quickly become permanently - and dangerously - intertwined when Lucas is asked to infiltrate the cartel and navigate the deathly politics of its powerful drug lords. Hell-bent on beating the odds and escaping alive, Lucas not only survives but begins to rise in the cartel's ranks. Life on the inside is dangerous, but there's power, protection, and money. The temptation is great for one who comes from so little. 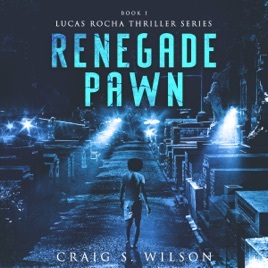 Renegade Pawn is part of the emerging Lucas Rocha Thriller series, which launches September 7, the anniversary of Rio de Janeiro's Independence Day. Someday, Lucas Rocha will find independence as well, but not without a battle! A new audiobook will launch every month through the end of 2018. If you love a pause-resisting action-adventure novel with mystery, humor, and a dash of romance, pick up Renegade Pawn today!